As Claus makes clear in his accompanying post, despite all the brouhaha of recent days, deflation is far from over in Japan. At the same time the Yen has once more begun to drift downwards against the dollar. In this note I will look at some of the implications of, and interconnections between, these two phenomena. Well it wasn't all that long ago that Claus was asking us when and whether the Japanese authorities would feel the need to intervene to stop the - at that point (9 Nov) - seemingly inexorable rise of the yen against the dollar. Obviously a few short weeks in currency markets are a very long time (which is why playing them has to be such a complicated business I feel), and as we can see from the chart below (kindly prepared by the people over at Daily Fx) since late November (ie just after Claus was having his think-out-loud) the market seems to have turned, and the yen has been in downward mode. So what should we make of all this? Well first off I think I should make clear that when it comes to technical arguments, like the ones used by Daily Fx about A-B-C zigzag-wave evolution and all that, I am absolutely ignorant, this is not my area and all I can do is recommend you go over and read their take to decide for yourself. My view on this topic would be very much a case of the blind leading the half-sighted. But... if I look at this chart as a macro-economist, then of course there are some things which seem to be blindingly obvious, and they fit in pretty well with the narrative we have been giving here at GEM as the year has progressed. Basically we need to think about the relative interest rate policies over at the Fed and the BoJ. Essentially the yen's slide after February 2007 (following some initial upswing momentum in January) can be tied to the disappointment generated by the inability of the BoJ to carry out a vigorous "normalisation" process on interest rates. This inability, of course, was closely tied-in to the underlying Japanese macro-economic "fundamentals" ( a topic which Claus goes into in much more depth in his accompanying post). Then as we reach July, growing bullishness from Fukui and the BoJ coupled with increasing stagnation in the US housing market produce a turnaround. The market seems to dither a bit around mid-October, as instability in the global scene has the effect that people really can't quite make up their minds whether the carry trade is going to unwind or not and whether Japan might not once more be turned into a safe haven in troubled times (hence all the coming and going, aka volatility), but the broad sweep of things continues until the market turns in late November, as people finally throw the towel in on the Japanese recovery, and talk moves away from when the BoJ will raise again towards how long it will be before we are back in ZIRP. In this sense I am inclined to back the conclusion that Daily FX draw from their technical analysis, but basing myself on the macro outlook. The USDJPY has fallen nearly 200 pips since Thursday morning after testing a resisting trendline that dates to June. This price action has many believing that the downtrend that began at 124.13 is back underway. However, our interpretation of the price pattern suggests that a rally towards 115.00 is still very much a possibility. As I say, I tend to agree, but my reasoning is other. 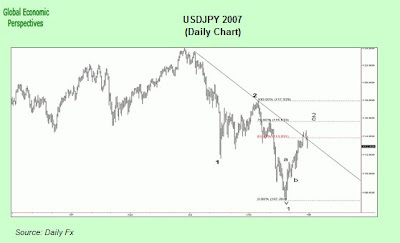 Apart from the ongoing weakness that we are likely going to see in the yen, as the interest rate differential with some other Asian and Latin American economies make carry to somewhere or other still an interesting business, we have to think about the underlying fundamentals of the US economy and the evolution of future monetary policy in the US (of which more below, at the end of this post). Should We Be "Happy" About The Return of Inflation To Japan? Another of the "big-picture" details about the present Japan situation which is worth commenting on is the very mixed reception which the perceived return of inflation to Japan is receiving (although please note I am a long way from being convinced that things are as clear as many are suggesting on this front - and neither, as you will have seen in his post, is Claus - and it may well be that this months data is just another one of those continuous "false starts" we have learned to accustom ourselves to when it comes to Japan, especially when you take into account that the reading on "core-core" inflation - ie stripped of food and energy is still negative). But in terms of whether inflation in Japan would be good news or not, I couldn't really help being struck by the lead paragraph in the Bloomberg coverage of the most recent Japan CPI data. Japan's inflation rose at the fastest pace in more than nine years in November and industrial production and household spending declined, signaling rising oil costs may derail the economy's longest postwar expansion. So what is going on here. Isn't the return of inflation to Japan just what everyone was hoping for? I guess the response of Swedish blogger Setfan Karlsson in his "Wasn't Rising Prices Supposed to be Good For Japan?" post will be a reaction which is typical of what many are feeling. Namely, "huh"! So where exactly are we right now on the deftaltion front in Japan? Is the momentary return of a positive reading on the core index to be welcomed or not? Is inflation a good thing or a bad thing? Obviously the answer is the ambiguous one of "it depends", and it depends especially on what exactly it is you are looking at, but the difficulty we are seeing in defining a consensus interpretation of this phenomenon does give us a good illustration of what a hellishly complex business macroeconomics is. Not for the faint of heart this subject, I'm afraid. Basically the problem is that economic systems are complex, and in them many variables are interconnnected in a way which may well produce important non-linearities in the way one parameter impacts on another. Inflation in Japan would be a good example. My feeling is that what you need in order to be a good macroeconomist is a feel for this complexity (and this is what sets the macro- off from the micro-economist, since the micro-economist is normally statisfied with some sort of partial analytic, you know, the good old ceteris paribus simulation, which may be very useful in terms of approaching certain very discrete and local phenomena, but turns out to be nearly useless when it come to real world, as it actually happens, macro). The macro-economist needs the ability to keep 3 or 4 (or more) variables in their head at the same time, and run sort of "what if" simulations mentally. Obviously it is hard to precisely assign an exact value to the number of parameters you need to keep spinning round simulataneously on any particular problem, or to give an explicit account of the system of virtual weights you implicitly assign to each of them, it is the scale of this that matters, and what counts if you want to do macro is the ability to carry out - on the fly - such large simultaneous mental simulations, since no computer model can possibly hope to handle the level of complexity involved, even if the parameters were well set up (ie included things like median age, fertility and life expectancy), which they aren't. 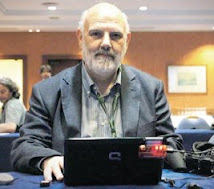 The situation here is basically analagous to the semantic interpretation argument in the Artificial Intelligence debate, and this kind of problem is one of the reasons why I personally feel machine translation is - at the very best - a long way off in the future, and the same really goes for "true to life" economic models. Try doing a machine translation from German into English, and reading through what you get. The print-out you get from running some version or other of MultiMod has just about the same degree of satisfactoryness when it comes to taking key policy decisions in difficult circumstances. And this is why, of course, the simple application of a Taylor-rule type inflation target in a case like Japan simply isn't adequate (or for that matter over at the ECB right now, you just watch them squirm and execute all manner of verbal acrobatics on this if some of the key eurozone economies start to tank while inflation continues above their beloved 2%). 1) Firstly, simply because it is easier to maintain stability on a bicycle which is moving forward than it is on one which is stationary or moving backwards, so 1 to 2 percent inflation under normal conditions is possibly ideal for an economy in general terms. I think even modern monetarists like Jean Claude Trichet accept this, and this is why the ECB, for example, has its target set on or around 2%, and not at zero. Now this is a strange statement, since there are plenty of indications coming out of Japan that there are subtsantial doubts about this, and particular there are doubts about the resilience of domestic consumption in the current recovery, as Claus has already ably explained in two excellent posts (here and here). Since Claus will comment further on the details of the current decision, what I would like to do in this note is step back a bit, and reflect upon some aspects of the situation which should give us all cause for serious thought. So what if last Friday the Bank of Japan finally ended its "zero interest rate policy" (yes, ZIRP)? After all, it's only a quarter-point rise, in a faraway country that doesn't interest most Americans now that it no longer seems a dangerous competitor. And yet I would not be surprised if future economic historians look back at Friday's move as the beginning of the end for an era, and not just in Japan. So what we have now is a rerun of what happened after the attempt to raise interest rates in Japan in 2000 signally failed (which was itself a rerun of earlier attempts back in the 1990s), since yet one more time the force that was mustered has been insufficient to overcome the resistance encountered. Would it be too much to ask that one of these days we got a reasoned and calm debate about why this might be, or is history here simply compelled to repeat and repeat itself? To repeat itself until of course Japan government debt (which is, naturally enough, now forecast to rise again next year on the back of renewed fiscal easing) reaches the point of no return moment, and then this story really willl come to an end, and more with a bang than a whimper I fear. But it would be very sad if things were to come to this pass without attempting to do something to avoid the eventuality first. I strongly recommend reading Claus's No Signs of Inflation in Japan (1 Feb 2007), Japan's Economy Chasing Illusions? (19th January 2007) which give all the background on the whole debate, and will let you see had a glance who had been arguing sound-sense here, and who none-sense. Now I did state that there are two potential grounds for feeling that a return of inflation in Japan - under the right business cycle conditions - would not be a bad thing, but I will rapidly correct myself, as there is also a third argument - one which brings us straight to the heart of the reason why what is happening in Japan is so important for everyone - since it refers to Japan's impact on the conduct of global monetary policy. Basically Japan having interest rates so near the floor creates uncomfortable problems for the entire world monetary system (the presence of the carry trade being only the most visible and high profile of these) and it was as a result of some of this discomfort - a world being steadily flooded with liquidity - that the Central Bankers and G7 Finance Ministers took their decision to try to encourage the "normalisation" of rates. The decision - which was based on the idea that the world was flooded with excess liquidity which badly needed "mopping up" - was initially implemented by the ECB, but the situation in Japan (and the role of carry) was never far from the forefront of people's minds, and the BoJ soon followed suit. The rub is that this "normalisation" process, far from being based on a decoupling phenomenon in some of the world's largest economies - obviously I am talking explicitly about Germany and Japan here - has only served to underline the ongoing weaknesses which exist in them. So I would argue that the G7 participants really do now need to have some sort of a rethink about what it was exactly they were trying to achieve. Core consumer prices rose faster than the 0.3 percent median estimate of 36 economists surveyed by Bloomberg News. Gasoline and kerosene contributed three-quarters of the gain, which was the quickest since March 1998, when an increase in the country's sales tax pushed the gauge to 1.8 percent. So the last time inflation showed similar signs of life Japan was pushed straight off the cliff and into recession. History may well be about to repeat itself yet one more time here. But the real question is when will people actually start to learn some of the costly lessons experience is offering us? So Where Are We Going in 2008? As I said earlier the future of the Yen in part depends on the future of interest rate policy in the United States, so what are we able to discern in the tealeaves here? Well as I argue in this post (and back up with some additional demographic data in this one here) it is hard to envisage a dramatic easing on the part of the Federal reserve at this stage. The problems that the sub-prime bust are creating for the US economy have probably been rather overrated (interestingly sales of existing homes rose ever so slightly in November, which is just a small reminder that in a key area like housing demographics - rates of new household formation - do matter). 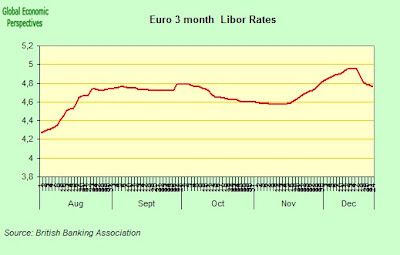 Sometimes I feel that there may even be a political interest in stressing that the global tightening in lending conditions is a spin off from a US problem (and not, say a Spanish or a UK one), since in countries with inherently fragile economies like Japan and Germany politicians and bankers may find it easier to explain to their citizens that what is happening is a result of a sub-prime bust elsewhere, rather than confronting head on where the real problem lies. This may be perceived as being more palatable for voters. Be that as it may, it seems to me that the US is more likely to be in for a "soft" than a "hard" landing, and this may well be reflected in monetary policy over at the Fed. What I mean by this is that the US slowdown may prove to be more protracted than many currently envisage - driven by liquidity constraints being placed by the banks on US internal borrowing, and by the continuing pressure on the US consumer wallet coming from higher oil and food prices (which are a knock on effect of the global recoupling process, and the increased purchasing power of people in the emerging economies, who are, let it be noted in passing, very numerous). One point that I think is worth making is that in the course of the great fertility debate many US contributers tend to emphasise two factors which they feel help account for the comparatively high levels of fertility seen in the US of late: the spacious family environment and the ubiquitousness of the private car. Now, these two areas are precisely where this slowdown is going to bite hardest and longest in an era of structural changes in energy costs, since the US urban landscape may now be out of line with the change in relative prices that a declining dollar and rising global energy demand is going to produce. What I am getting at here is that if we ever do get a rising yuan, and the rupee continues its rise, then energy will get steadily cheaper in these countries in relative terms. I think this is not going to be a marginal, incidental point. So the US slowdown may well be more protracted, but softer, than the markets are currently pricing in, while the Japanese slowdown may be more protracted and harder. Both these points argue in favour of continuing yen weakness vis-a-vis the US dollar in my opinion. Finally I would add just at two caveats, and these concern the question of safe-havens and China. At this point in time we do not know what the global correction that we will in all probability see in 2008 is going to look like. We do know that some emerging economies will quite likely be badly affected (Eastern Europe, possibly Russia) while it seems likely that others (Argentina, Chile, Brazil, Turkey, Thailand and India) may well continue to power ahead. But we don't really know the details of how recoupling is going to work out in practice, and we don't know precisely which "safe havens" all those savings that continue to pile up in the pension and hedge funds will have recourse to. If Bretton Woods II is in the process of unwinding, and Bretton Woods III is in the process of being born, the we should expect to see changes here. As a knee jerk reaction, any initial instability in Asia is likely to send money across to Japan, but this may not be back to the "usual business", and particularly not if some large Asian economies - India?? - continue to grow at a hefty rate. The other big unknown in 2008 is China. Most analysts are assuming a very gradual slowdown in China. Here I have my doubts. The inflation problem they have is a real one, and at this point in time it is hard to see how they can adequately address it. Certainly unchaining the yuan could just as easily lead to an acceleration of inflows and an increase in the overheating problem as to any more benign outcome, and I would treat New Zealand (and India for that matter) as the "Canary in the Coalmine" (or if you prefer "smoking gun") here. So I would just like to put up a question mark on this count, and I would do this especially in the context of the underlying and strong structural break in the Chinese population pyramid which has been produced by many years of the one child per family policy. Looking at those other canaries - Latvia and Estonia (and then Russia) push-comes-to-shove time does seem to arrive a lot earlier than we had all been anticipating. 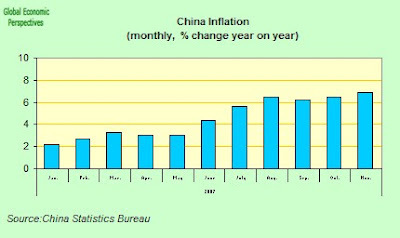 As I say, 2008 could well be the year that inflation gets a hold on China. Certainly the strong uptick in the latter months of 2007 is evident, as can be seen in the chart below. Curiously this uptick coincides exactly with the peaking of the 15 to 19 age group, as you can see in the chart, and the decline in this age group from here moving forward is really quite dramatic, as you would expect from the drastic policy measure which was applied. I have selected the 2022 horizon looking forward based on the fact that this is now known data. We can predict with a reasonable degree of accuracy just how many 15 year olds there will be in China in 2022, since they have now already been born. So we have a pretty good idea of China's new labour supply going forward. Obviously China can still get considerable growth by relocating the existing workforce across sectors to more productive ones. But the end of the labour intensive low economic value growth must now surely be in sight, and the big question is can China sustain inflation-free growth of the order of magnitude we have been seeing in recent years, bearing in mind that much of the recent growth in many of the higher growth developed economies - the US, the UK, Ireland, Spain - has been very labour intensive. My feeling is that it can't, this is why all those exhausted canaries swooning in Latvia have been so useful, and that we will see a slowdown in China which will not simply be cyclical, but rather structural. Possibly the moment of inflection (or tipping point) here will come around the time of the Olympic Games. 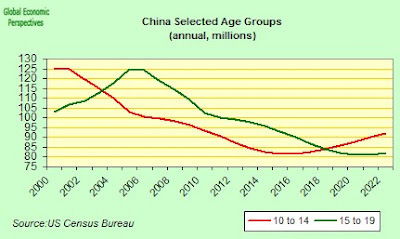 So, as I say the 15 to 19 age group has now peaked in China, and from here on in it is essentially downhill all the way, as far ahead as anyone can see. The truth is that no-one at this point in time knows what the consequences of this are going to be. But don't worry, since at least one thing is for sure: we are all just about to find out. Well, a Merry Xmas and a Happy New Year to all our readers from me (Edward), Manuel and Claus, and all the crew here at GEM. Thank you for taking the time and trouble to pass-by. This blog will now - failing major and surprising new developments in the global economy - be offline till the end of the first week in January (but don't miss our mamouth three part tag-team effort on Thailand below) - or till after the festival of Los Reyes Magos in Spain (for those of you who know what this is all about). Come to think of it, maybe this is just what our ever hopeful central bankers are in need of even as I write - some surprise presents from the three wise men - but I fear that this year if these worthy gentlemen do somehow show at the next G7 meet, the star in the east which draws them will not be the one described in the traditional texts, but in all likelihood the rising star of India. Credit crunch, did someone use the expression credit crunch? Voters in the Kingdom of Thailand went to the polls on Sunday, December 23, 2007 in the first parliamentary election held since the September 2006 military coup that overthrew the elected but increasingly authoritarian and allegedly corrupt government of Prime Minister Thaksin Shinawatra. Thailand's legislature, the National Assembly is composed of the Senate and the House of Representatives; the latter has 480 members, of which 400 are elected in 157 two- or three-seat constituencies, while the remaining eighty seats are filled in eight electoral regions by party-list proportional representation. Since a 1932 revolution brought an end to eight hundred years of absolute monarchy, Thailand has suffered numerous coups, and the country has alternated between intervals of at least nominal democratic governance and periods of military rule. The democratic interludes were often characterized by fractious multi-party politics, weak coalition governments, and the participation of high-profile military figures in prominent leadership roles. However, in the 2001 general election the new Thai Rak Thai (TRT; Thais Love Thais) party of Thaksin Shinawatra, a billionaire telecommunications tycoon, emerged as the dominant political force, displacing the traditional parties on a populist platform of development money for rural villages, debt moratoriums for farmers and low-cost health care. Despite accusations of nepotism and cronyism, Thaksin remained highly popular among the rural poor, particularly in the northern and northeastern parts of the country. As a result, TRT won a large parliamentary majority in the 2005 general election, and Thaksin was able to form the first single-party government in the history of Thailand. However, Thaksin's triumph proved to be short-lived. His government became even more intolerant of opposition criticism, and a snap legislative election called the following year in the wake of mass protests demanding Thaksin's resignation was boycotted by the opposition parties. The vote was subsequently invalidated by Thailand's Constitutional Court, and a fresh election was slated for October 2006, but the military staged a coup prior to the election and overthrew Thaksin, who was at the time in New York City. Corruption was cited as the reason for the coup, although widespread discontent about Thaksin's heavy-handed suppression of an armed insurgency in Thailand's predominantly Muslim south (the rest of the country is overwhelmingly Buddhist) appears to have been a major contributing factor as well. The election is being held under a new constitution approved by voters last August - the country's sixteenth since 1932; however, martial law remains in force in 31 of Thailand's 76 provinces. TRT was dissolved after the 2006 coup and party leader Thaksin has remained in exile (for good measure, he was banned from taking part in politics for five years, along with more than a hundred prominent party figures), but a pro-Thaksin party - the People's Power Party (PPP) - has emerged as a major contender in the election. In fact, PPP leader Samak Sundaravej - an old hand in Thai politics - has made no attempt to conceal that 1) he's Thaksin's surrogate; and 2) that he wants to bring Thaksin back. In fact, Thaksin - who faces corruption charges in Thailand - has indicated he will return early next year. Meanwhile, the Democratic Party (PP), the main opposition party during Thaksin's tenure in power, is likely to emerge as the PPP's main challenger under the leadership of Western-educated, 43 year-old Abhisit Vejjajiva. However, neither party may secure an absolute parliamentary majority, and several smaller parties may hold the balance of power, chiefly among them Chart Thai, led by former Prime Minister Banharn Silpa-Archa (another old-school politician). It's no secret that the military does not wish to see PPP in power, although they have insisted that the outcome of the election will be respected regardless of who wins. Nonetheless, it is anticipated that if no party secures an overall majority, the armed forces will exert pressure over the smaller parties to reach a coalition agreement with the Democrats. What's less clear is what would happen if PPP wins an absolute majority. There have been rumblings about alleged PPP vote buying - in truth, an endemic problem in Thai electoral politics - and it's quite possible that the vote could be at the very least partially annulled (or PPP forcibly disbanded) on the grounds of electoral irregularities. A further military intervention cannot be ruled out, but if it takes place it may well generate far less public sympathy than the 2006 coup, particularly since the interim government put in place by the armed forces after the coup has proved to be inept, and Thailand's economic growth is now the slowest in the region. Nonetheless, the return road to democracy may turn out to be a rocky one. In a stinging rebuke to the military, voters in Thailand gave the People's Power Party (PPP) a plurality of seats in last Sunday's legislative election. According to preliminary election results, PPP won 232 of 480 seats in the House of Representatives - nine short of an absolute majority. Meanwhile, the Democrats obtained 165 seats, while Chart Thai (Thai Nation) secured 37, Puea Pandin (Motherland) 25 and other parties captured the remaining twenty-one seats. Although PPP won the largest number of both constituency and proportional seats, the Democrats polled a very narrow plurality of the party list vote. PPP has indicated it has the votes to form a government - the party would have a parliamentary majority with the support of either Chart Thai or Puea Pandin - potentially setting the stage for a collision course with the armed forces, which remain in a position of considerable influence under both the new constitution and an internal security law adopted shortly before the election, that grants the military the power to intervene unilaterally in the political process. Thailand's Economy - At a Crossroads? As we never tire of pointing out here at this space the analysis and proper understanding of the global economy and more specifically her markets demand a vigorous interaction and -play between the overall broad conceptual analysis and the more nitty-gritty country analysis. Today, and as most people, in the Western World at least, rev up for some of that most scarce and precious quality time with friends and family I feel inclined to wander off over to Thailand for one last spout of economic analysis before closing down for the holidays. Before I start I think it would be only fair to point out that I am not exactly an expert when it comes to Thailand's economy but rather I shall progress in the spirit of traditional writings here at GEM where authors attempt to aspire to the ideal and tradition of the polymath rather than towards the profile of the 'genius savant' in one specialist area. Yet, and despite my denial of expertise in the area of Thai economics I think it is safe to say that Thailand commands a rather special place in the whole global economic framework for two main reasons. The first is strictly endogeous to political life in Thailand, where the frequency with which governments are toppled by the military only to be subsequently re-inserted (with a quick change of label), is rather high when compared with most other members of the emerging economies leading group. The lastest example of this tendency was handed to us a little over a year ago when General Sonthi Boonyaratglin ousted prime minister Thaksin Shinawatra and declared that a military junta would stay in power for a year. Such abrupt changes of government (and of course the way of changing them) have a tendency not to go down too well with foreign investors and naturally have tended to affect the ability of Thailand to attract foreign capital inflows, as well as to act as a source of outflows. Of course, many would, at this point in time, simply exclaim that since these things are now a natural part of the political cycle in Thailand they are already well priced-in to current market premiums. I will leave this issue here and simply note that whatever importance we ascribe to the political situation in Thailand, an interventionist military is certainly part of the picture and needs to be taken into account. The second reason for Thailand's rather special position in the international economic environment is to be found by going back to 1997 and the Asian currency and financial crisis. 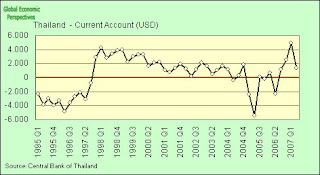 As I am sure many of our readers remember Thailand acted was one of the principle centres of attention during the boom phase and then one of the victims of the sudden and abrupt retrenchment of private inflows to emerging markets which occured during the Spring and Summer of 1997. This would then translate into a modern day 'once bitten twice shy' mantle and although I am unsure whether this actually applies for Thailand it serves us well always to remember that debating capital flows in the context of Thailand always will tend to have that historical glow around it. In order to deliver a reasonable crack at answering this after all very general question I need to invoke the headline of this note. In my opinion and as I will try to argue below Thailand is now at a crossroads. On the one hand Thailand finds itself right smack in the middle of the sweet spot relative to the ongoing demographic transition known as the demographic dividend. As we know this does not by any means constitute free lunches - of which, of course, there are very few, if any - but rather a golden opportunity for Thailand to move now in order to make sure that it does not go down the road of other rapidly ageing emerging economies of which China is perhaps the most important and best known example. However, if Thailand is to get rich before she actually gets old the window is closing fast. By inspecting the graphs over at the Thailand Economy Watch we can readily see that Thailand with respect to its demographic position is now borderline between two extremes. 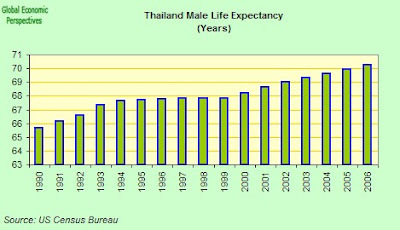 The fertility rate has been stable at about 1.6 for the past 8 years and coupled with a rapid increase in life expectancy (which of course is a good thing) Thailand is now set to age rather rapidly. 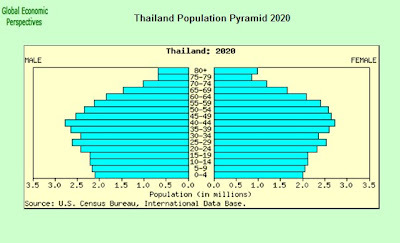 However, the effects of the ageing process are likely to be subdued in the interim as Thailand will enjoy something like 15 years of demographic headwind before reaching that ever so important 40 year median age threshold. Now, and although I realize that I have not yet fielded one single economic chart let me be very clear. A great deal of Thailand's economic future rests upon whether the economic growth which is now set to come and continue all things equal will bring Thailand a further notch into the demographic transition bringing TFR below the 1.5 mark. I really hope not and if there ever was an important objective for policy makers in Thailand it would be to make sure that what comes next is accompanied by an effort to keep the fertility rate from falling further, and preferrably, to find ways to nudge it back up to a slightly higher level. This would then bring me back to the present, which is what indeed is set to happen next in the context of the global and thus the Thailand economy? 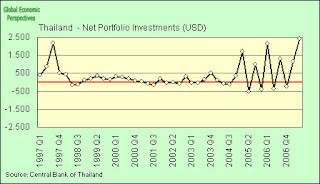 Let us begin with a kind of overview of the Thailand economy such as it. 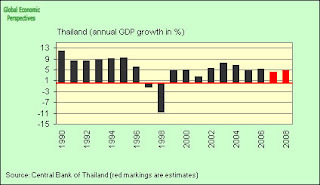 As we can see from the two graphs fielded below, Thailand's prosperity has done been on the rise over the past 15-20 years, - a much more modest rise following 1998, but a rise nonetheless - and there is really no reason to believe that this will not continue to be the case in the immediate future. The Asian Crisis as it occured in the 1997-1998 is certainly not absent from the charts and you could even, if you are into such matters, debate whether in fact Thailand suffered an irreversible blow to its growth trend back in 1997? For more on this topic go here. As for the short term economic data on Thailand, the most recent central bank inflation report (PDF) provides us with ample ammunition to get a more solid grip on the immediate outlook. If we scrutinize the data a bit more closely we see that growth in Thailand seems to have moderated somewhat when it comes to the evolution of headline GDP. This slowdown which must be considered in relative terms has coincided with a subtle but important change with respect to the engine of headline GDP growth. 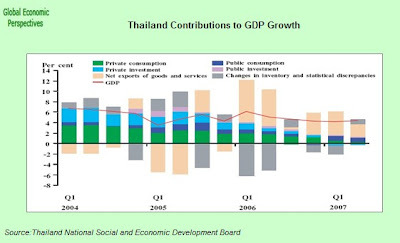 As can readily be seen from the chart the central bank provide (reproduced below) as private consumption and fixed capital formation have waned net exports of goods and services have slowly but surely been taking over as the main engine of economic growth in Thailand. 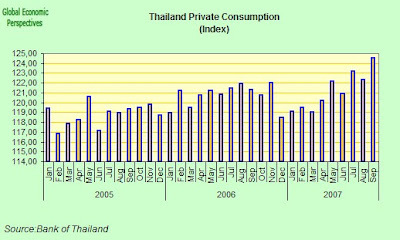 This is of course an important trend to take into account since it does mean that Thailand is subject to the whims of global markets to a higher degree than had been the case if private consumption had been doing the heavy lifting. Clearly, at this point we should remember that the time-span in question (i.e. Q2 2006 to Q3 2007) is exactly the period where domestic political uncertainty took a hefty leap upwards. So, it is really difficult to discern a notable trend in all this. However if we look at the central bank's private consumption index we can see after a slowdown at the end of 2006 (which would be associated with the political uncertainty) things do now seem to be turning back up again, so we may well be in a recovery phase. Another notable feature of the recent trends in the Thai economy is the rather subdued rate of inflation which has come down over the course of 2006 and now into 2007/2008 as well. This seems somewhat odd when you look at the figures on the labour market where it quickly becomes clear that Thailand is firing on all cylinders at the moment with a monthly registred unemployment rate below 2% and somthing like 35 million people in work out of 64 million inhabitants. Indeed between the summer of 2005 the summer of 2007, Thailand added the best part of a million new jobs. This is really what the demographic dividend is all about, enabling rapid employment growth without provoking inflation. The demographic dividend isn't a policy, but it does produce an environment which is more favourable to the application of good policy. This could indicate then that if consumer spending and confidence continue to enjoy a rebound, and if the political situation has reached some sort of resolution then the inflation gauge might start to tick upwards as we venture into 2008, especially in the light of the general global tendencies in base commodity and food prices. Finally, we have as I have already hinted above the trade surplus which since Q3 2005 has averaged around 15% of GDP offers Thailand a firm buffer for solid headline growth. This then serves us to move further into the argument in this note and as such to the more specific point on capital flows which are central for the understanding of the current changes in the global economy and thus also Thailand. 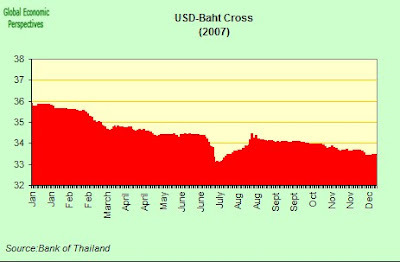 Capital Flows and Thailand - To Receive or to Send? 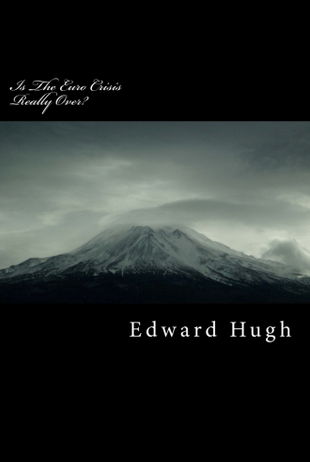 Starting out with capital flows in the global economy I recently narrated the current economic climate as fairing in uncharted waters given the delicate situation in which we are now finding ourselves. This uncharted waters theme should not however be misinterpreted as lack of oversight which I feel we at GEM have plenty of. Rather, we are simply noting that what happens next will be an important test for many of our theses and arguments. In this way and homing in on what is especially important in the context of Thailand we have the mounting signs and evidence that the structures and chains of Bretton Woods II are slowly but surely being worn thin. These changes however do not seem supportive of those who have spent their time arguing for a process of de-coupling in the traditional sense whereby the US hands over the baton to a train being run by a joint tag-team consisting of Europe and Japan. Private investors want to finance deficits in countries that don’t want to run deficits. The countries now accumulating reserves the fastest have the least need for reserves. The country with the largest deficit is struggling to attract enough private inflows to match the increased desire of its private sector to buy foreign assets – let alone both the deficit and those outflows. And the country with the strongest traditional aversion to state-ownership is now the country most-reliant on government inflows. Once again, we can easily see when the Asian Crisis occured in the beginning of 1997. Other things to note is the fact that volatility seems to have returned to the overall CA balance in the recent years which is something I will talk a bit further about below. Secondly, and following from this point we see that foreign investors seems to have once more become rather fond of putting their funds in Thailand over the last couple of years as compared with the relative stagnation in the years following the currency crisis. This is can be further substantiated by a chart showing the flows of net portfolio investments. So now we have capital controls, not to stem an outflow of foreign exchange, but to stop an outflow of domestic currency. Oh how the world has changed. 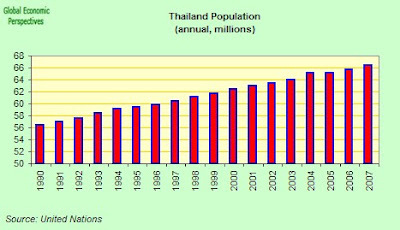 Of course, it should escape no-one's notice that with fertility now well below replacement (somewhere in the 1.6 tfr range) Thailand is now right in the middle of that Demographic Dividend/Demographic Transition process I keep talking about. Indeed, the world seems to have changed and Thailand now must decide how to position itself in this new situation. And this my dear reader brings me back to where I started and how Thailand now seems to be set a crossroads and while it may not be a question of losing your horse or your head, it does seem as if whatever road Thailand chooses it is a choice of some importance. In this way, Thailand seems to be faced with, at least, two interconnected choices moving forward from here. The first issue as I have hinted above is whether Thailand will be able to get the demographic house in order or not. There are of course many unknowns here either way but one thing seems fairly certain at this point. With life expectancy shooting upwards and fertility lingering at a TFR of 1.6 the next 12-15 years of economic development will be very important. 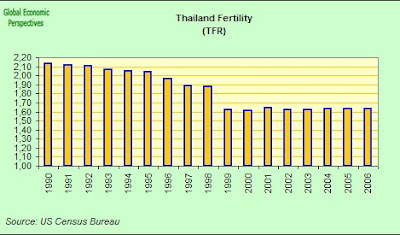 If evidence from other countries is something to go by Thailand faces the imminent risk of tumbling down into the sub 1.5 TFR region which essentially constitutes something of a fertility trap. I strongly advise policy makers and others to strive so that this does not come to pass. The second challenge which stands before Thailand relates to the whole changing structure of the international economic system and essentially the point that what we considered yesterday to be a distinction between developing and developed countries today is nothing but another anachronism ready for the big historical bin. In short, which strategy should Thailand deploy in an environment where liquidity is aflush and where the global search for yield is on? There is no straightforward question to this answer and in particular when we are talking about Thailand you cannot but expect that the old 'once bitten twice shy' dictum to be high on agenda. However, as I have also tried to argue above the times have changed immensely from 1997 and now Thailand is busy keeping money from pouring instead of pouring out. Consequently, it was only back in the beginning of December that we learned how authorities in Thailand were considering lifting capital control following today's elections (23rd of December). This then trickled down onto the jungle drums where echoes of double digit % Bhat appreciation were flying all over the place. Indeed, the Bhat has been on an upwards path as of late against the USD and now as the new government readies itself to take office we shall see what happens. However, what would my view be on this then? Well, I certainly don't want to come off as being complacent towards allowing money to come in too quickly since when this happens there is always the risk that those very same funds may leave just as swiftly again. Nobody would know this better than those interested in Thailand's economy. However, perhaps we should also take heart of the fact, and as Edward so eloquently emphasised in the context of India recently, that the sands and seeds of time cannot be made to run backwards. At the end of the day you could then ask the most prominent question of whether in fact Thailand has a choice or not? Of course it does, Thailand like India, Brazil, and Turkey cannot just with a simple stroke of a magic wand absorb the procedes of a full scale of re-balancing/re-coupling of the global train. However, trying to stem the tide by building barriers is not likely to do any good either. Conclusively, I want to finish off by adding that I see a whole lot of potential for Thailand's economy going forward. It is going to be a bumpy ride for sure and wills and wit will be tested but so it is with history and the future. Both of them are very much with us in the present. The last thing I would like to emphasise is the danger that Thailand follows the path of China not, of course, with the one-child policy per se but rather with respect to the path of growth where I clearly see an important link between the two; demographics and growth path that is. Export dependancy it seems, and not as per usual like all good things, will come to those who wait. Let that be a subtle reminder for Thailand as the country equips itself for a new year with new challenges. This post is really a supplement to Claus's post Thailand at the Crossroads, and a complement to Manuel's election coverage. Now Claus points out that Thailand is in the middle of its ongoing Demographic Transition, and at the high point of that favourable moment when what has become known to economists as the Demographic Dividend process is at its height. The demographic transition is - in simple language - a movement upwards in population median ages. Societies (one after another) move steadily from being high fertility, low life expectancy, low median age ones (think Niger, or Mali, or Uganda right now), to low fertility, high life expectancy, high median age ones (think Germany, Japan and Italy) in a more or less steady and ongoing fashion. We know of course what the starting point of this transition is (the above mentioned high fertility societies have a median age in the 17/18 range) but we don't know where the end point is, since while Germany, Japan and Italy currently have a median age of 43 things clearly are not set to stop at this point, and we won't really know what the ceiling is in this process till we reach it. So on this count we have to watch and wait. But observing the evolution of these three "elderly" societies we can identify some of the processes which are at work as population median ages rise, so while we are waiting for the final readout there is still plenty of work to be done - in terms of policy measures to be adopted - in the meantime. Thailand is one of those fortunate countries who, having arrived on the developing economy scene rather later than others, can learn somewhat from those who have gone before. If she is ready willing and able to listen that is. Now Claus and I do put quite a lot of store by the median age reading of a society, and we do this for all sorts of reasons. Basically median ages serve as a very convenient proxy for all kinds of economically important phenomena like saving and borrowing, fixed capital formation, construction activity and export dependence, productivity, and ultimately labour and consumer supply. The movement up through the various median age levels involves a constant change in population structure, and at one point these changes are very favourable to economic development. These positive changes provide the background to what is known as the demographic dividend process. At the end of the day the transition from being a very low median age to being a very high one involves a shift in the dependent population, from having a very high proportion of young dependent population to having a very high proportion of elderly dependent. In the middle lie the most favourable years, which come in two stages. In the first stage there is simply an increase in the volume of people available for the transition to work in an expanding market economy. This could be thought of as the accumulation of inputs phase - during which time, as we can see in the chart below, the rate of population inctrease continues to be large - and at this point a societies ability to incorporate ever more people into relatively low-value economic activities at a rapid rate produces a growth spurt - like the one we are seeing now in many of the emerging economies. This is why, for example, Thailand can easily contemplate annual growth rates of 7 or 8 percent at this point without setting off the inflation alarms, something which, unfortunately, is not possible in Eastern Europe. But the dividend doesn't end just when the steady downward movement in fertility starts to make itself felt by reducing the inflow of young workers at the labour market entry point, since there is a second dividend phase were the accumulation of quantity is followed by the accumulation of quality, and this is made possible by the steadily growing share of workers in the 25 to 50 age group, and by the rising human capital quality of the new young labour market entrants. This is when you could expect a productivity driven "TFP revolution" and a steady shift through the value sectors towards the more productive and higher value ones. Of course there is nothing automatic about any of this, demography just provides an environment, then it is down to policy to benefit from or fritter the potential which exists. Thailand at this precise point in time is, as Claus indicates, at the crossroads. Labour supply means it is possible to obtain quite strong GDP growth simply by increasing employment, without necessarily achieving large scale productivity gains. But Thailand now needs to move on to the second stage, and rapidly so, since the low fertility environment means that this flow of labour is steadily going to dry up (of course migration from Malaysia and Myanmar can help offset this to some extent) and that growth will now need to become more productivity "intensive" if living standards are to continue to rise. Why is this such an important moment. Well let's look at Thailand's median age. 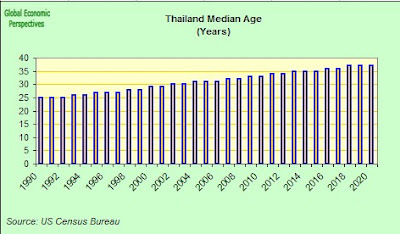 As we can see, Thailand's median age has been rising quite rapidly since 1990. It is now in the early 30s - which is definitely a very favourable point - but by 2020 (according to the UN median forecast) it can have risen to 37. And this estimate is very likely rather conservative, since it anticipates a rebound in fertility from the current, below replacement level, of 1.6 TFR. This forecast may well be overly optimistic when you think of what has happened in other developed Asian societies like Japan, Singapore, South Korea, Hong Kong, Taiwan, where fertility has fallen to the 1.2-1.3 range (and of China, where things may well be heading rapidly in this direction). Increasing education among women and rising living standards may well lead to increasing birth postponement (women having children at later ages) and we already have extensive evidence of the impact of this process on the TFR readout over extended periods of time. Also life expectancy has been rising, and may well continue to rise more rapidly than the median forecast anticipates. What all of this means is that if the upside risk to the Thai median age forecast turns out to be the case, then Thai median age could easily be brushing up against the watershed median age of 40 by the time we get to 2020. This age is important, since it seems to mark the frontier between an internal consumption driven society to an export dependent one. If Thailand hasn't made the leap from being a developing to a developed economy by this point her future could become very complicated. So the years to come are critical, which is why we are speaking of "crossroads". Nowhere is this situation clearer than in the evolution of the 15 to 19 age group (see chart below). 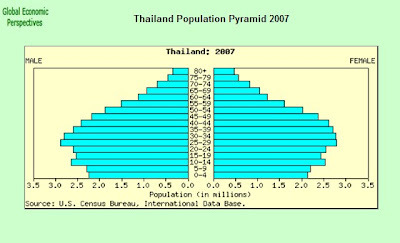 Thailand has a "loval peak" in this population around 2012. So during the next few years there will be a growing number of young people entering the labour market. So this is a very good time to get the labour intensive part of the development operation done. 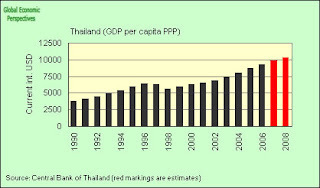 Post 2012 Thailand can move progressively towards greater dependence on productivity and TFP (if all goes well that is). Fortunately, as I indicate in this post on India here, the global environment is likely to be very favourable. In addition Thailand's more recent and measured entry into the low fertility club (unlike, for example, Eastern Europe) means that she is capable (as Claus noted) to run quite rapid growth rates without hitting the solid wall of substantial wage inflation. So she has the wind behind her. Much more than she did in 1998. If we just briefly look at the chart for gross fixed capital formation for a moment. 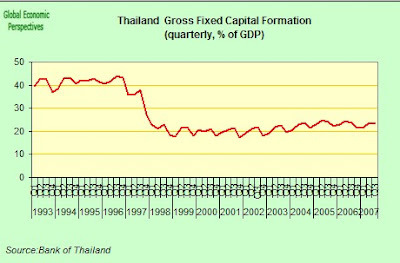 Now it is very easy to see the massive distortion in investment which took place during the boom of the mid 1990s, how the correction was more or less inevitable, and how Thai Gross Fixed Capital Formation is now on a much lower and more sustainable level. So to some extent the "correction" worked. Also it should be noted that in the mid 1990s Thai median age was somewhere in the mid 20s (like Venezuela, or Ecuador right now, and these are hardly shining examples of political and economic stability). So Thailand was the victim of the Asian financial markets telling themselves the wrong story. Ideas and perpsectives do matter, since they serve to orient behaviour and expectations (those famous compasses and charts that Claus goes on about). Our apparent obsession with median ages isn't simply an obsession, and it isn't all rigmarole and obfuscation, it is part of a search for the "grail" of growth theory, then underlying mechanism. 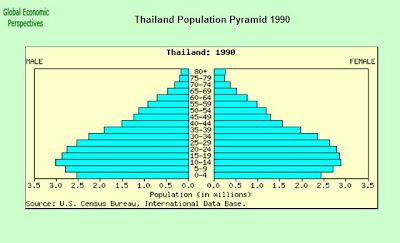 Finally, just to illustrate what we are talking about, I present my habitual "exhibit A", Thailands population pyramids. These show the age structure transition which is taking place before our eyes clearly enough I think. OK, that's it. Have a nice xmas everyone, and good luck Thailand, you will need it. Here are some links to economic literature on the demographic dividend. The Economics of Demographics, special issue of the IMF's Finance and Development Magazine, September 2006. Bloom, David E., and David Canning, 2004, "Global Demographic Change: Dimensions and Economic Significance," in Global Demographic Change: Economic Impacts and Policy Challenges, proceedings of a symposium, sponsored by the Federal Reserve Bank of Kansas City, Jackson Hole, Wyoming, August 26–28, pp. 9–56. Lee, Ronald, 2003, "The Demographic Transition: Three Centuries of Fundamental Change," Journal of Economic Perspectives, Vol. 17 (Fall), pp. 167–90. National Research Council, 1986, Population Growth and Economic Development: Policy Questions (Washington: National Academies Press). Bloom, David E., David Canning, and Bryan Graham, 2003, "Longevity and Life-Cycle Savings," Scandinavian Journal of Economics 105, pp. 319–38. Bloom, David E., David Canning, and Jaypee Sevilla, 2002, The Demographic Dividend: A New Perspective on the Economic Consequences of Population Change (Santa Monica, California: RAND). Bloom, David E., and Jeffrey G. Williamson, 1998, "Demographic Transitions and Economic Miracles in Emerging Asia," World Bank Economic Review, 12, pp. 419–56. Mason, Andrew, 2001, Population Change and Economic Development in East Asia: Challenges Met, Opportunities Seized (California: Stanford University Press). Ukraine, whose economy will miss its central bank inflation target for a fourth consecutive year running in 2007, should adopt a budget surplus in 2008 to help curb consumer price growth, the International Monetary Fund said earlier this week in the concluding statement issued on completion of its staff mission to the country. "The Ukrainian economy has enormous long-term growth potential, as industrial efficiency continues to improve, financial markets deepen, and its structure of production evolves. "However, there are near-term challenges. First, inflation is on the rise. While much of the increase in 2007 reflects food prices, strong domestic demand growth has intensified underlying inflationary pressure. Moreover, the current account position is eroding, and further deterioration in the years ahead—gas import prices may rise further and world steel prices may fall toward their long-term real average—could raise external financing risks. Finally, rapid credit growth points to rising risks in the financial sector. Stability-oriented fiscal and monetary policies, a stronger monetary and financial sector policy framework, and progress on structural reform are needed to help Ukraine achieve high growth with low inflation and improve the living standards of all its citizens. Does any of this sound familiar? It should do, at least to those of you with an interest in economics and what is going on at the moment in Central and Eastern Europe it should, since this profile is very typical of one we have seen extending itself right across the whole region in country after country over recent months. Claus Vistesen has already extensively covered (in this post) the issue of what is called "translation risk" (or what might get "lost in translation" if an effectively "dollarised" currency like the Ukranian Hryvnia is allowed to fall substantially at some point - to tackle, for example, the problem of the lack of export competitiveness which results from the combination of the rise value of the currency and the ongoing above-par inflation which is currently being sustained in many Eastern European countries). GDP growth in the Ukraine has been "solid" but not "exaggerated" this year (think the Baltics or Bulgaria in comparison), and at this point been slowing slightly, running at a year-on-year rate of 7.2% from January to November. 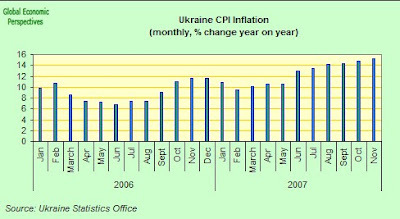 The Ukraine government now forecasts inflation to stabilise at 9.6 percent next year, having missed its 7.5 percent target for this year. This view may be hopelessly over optimistic. Inflation ccelerated to 15.8 percent in November and will probably atttain 16 percent plus this month, according to a statement from President Viktor Yushchenko's office. Inflation is the biggest of the "near-term challenges" according to the IMF. I would certainly agree, and while much of the increase we are seeing in 2007 reflects food price rises, strong domestic demand growth and a set of underlying structural demographics which also serve to intensify the inflationary pressure. The Ukraine Cabinet announced on Nov. 21 that it now plans to run a budget deficit of 1.86 percent of gross domestic product next year, compared with the shortfall of 2.33 percent of GDP which was initially planned. 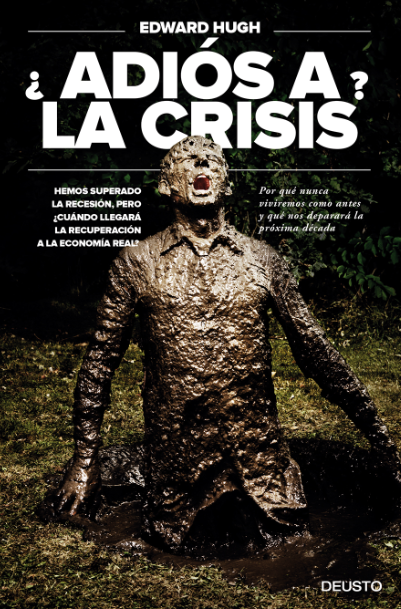 The IMF argue for fiscal surpluses as a means of draining liquidity from domestic demand since, given the strong wave of inward capital flows that comparatively high growth countries like Ukraine are expeciencing, and the widespread availability of low interest non-local currency denominated loans. 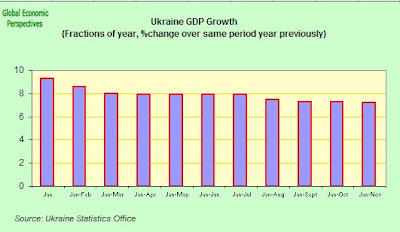 The difficulty which comes into operation in a situation like that in Ukraine, where there is considerable dollarisation of the local economy, is that exchange rate and monetary policy become either effectively non-existent (in the former case) or impotent (in the latter) to correct growing competitiveness problems - since given the extent of dollarisation it is not practical to adjust the exchange rate downwards and increasing the interest rate only puts upward pressure on the currency, and encourages the contracting of non-Hryvnia denominated loans. The tightening of monetary policy also serves to attract additional funds in search of extra yield and these only serve to make the excess demand problem even worse. Thus the only real arm left in the government policy arsenal is the fiscal policy one, whereby the government attempts, by running a fiscal surplus, to "drain domestic demand" from the system, and thus work to effect some form of price deflation (for a fuller discussion of this complex topic in the Latvian context see this post). And this, of course, is exactly the policy that the IMF economists tirelessly advocate that the Ukranian government practices. But it is exactly here that we hit a problem, since far from running a fiscal surplus as the situation requires, the Ukrainian government has been running fiscal deficits, even if, up to the election year of 2007, these have been reducing. One of the things we should now be learning from looking at what is happening across Eastern Europe is that in an environment where a number of underlying problems exist - ranging from a lingering and heavy state presence in the economy, a high public sector debt and deficit level, an absence of strong goods exports competitiveness, labour supply shortages due to migration and long term low fertility, and extensive euroization of the banking sector - heavy capital inflows can come to seriously strain the entire macroeconomic framework. This risk becomes even greater if measures are not taken to drain excess liquidity from the system (by running a fiscal surplus for example), to loosen labour supply constraints by facilitating inward migration of unskilled workers, and to accelerate the pace structural reforms - and particularly those which facilitate the development of "greenfield" investment sites which help channel capital flows towards productivity-enhancing uses and in so doing raise exports. 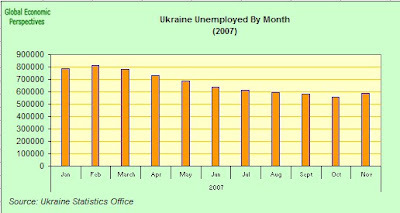 According to data from the Ukraine Statistics Office the national population fell by 232,485 people from January to October of 2007. This was a result of the fact that while there were 397,806 births (up from 383,384 during the comparable period for 2006) there were also 630,291 deaths (down slightly from 631,403 last year). What this means is that Ukraine's population is now falling at an annual rate of 0.675%. This is very fast, for population decline, and remember this is the natural decline, not counting out migration. 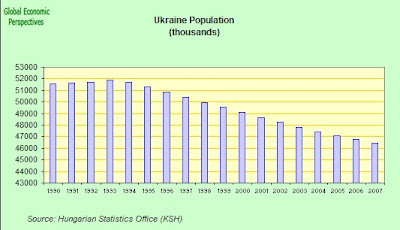 As we can see in the chart below the Ukraine population peaked in 1993, and has been in some sort of free-fall ever since. There are a number of factors which lie behind this dramatic decline in the Ukrainian population. One of these is fertility, which is currently in the 1.1 to 1.2 Tfr range. In fact Ukraine's fertility actually dropped below the 2.1 replacement level back in the 1980s. A second factor which influences population size is life expectancy, and in the Ukraine case the recent evolution of life expectancy has been most preoccupying, since it has been falling rather than rising in recent years. In particular male life expectancy which is currently running at around 64. Apart from stating the obvious here, we should note that the deteriorating health outlook which this low level of life expectancy reflects places considerable constraints on the ability of a society like Ukraine to increase labour force participation rates in the older age groups, and this presents a big problem since increasing later life employment participation is normally though to be one of the princple ways in which a society can compensate for a shortage of people in the younger age groups. The third factor influencing population dynamics is obviously migration. Ukranian out migration since the turn of the century has been distinguished by two factors, a reduced intensity when compared with the rather dramatic population movements which characterised the 1990s, and by a significant change in destinations. From migrating East the Ukranians are now moving West. Data on this latter movement has not been systematically collected but we have some national data on Ukranians in Portugal, Spain and Italy, and lots of anecdotal information about Ukranian migrant workers in Latvia, the Czech Republic, Poland and elsewhere in the EU 10. According to information provided by Ukrainian diplomatic missions, 300,000 Ukrainian migrants may be working in Poland, 200,000 each in Italy and the Czech Republic, 150,000 in Portugal, 100,000 in Spain, 35,000 in Turkey, and another 20,000 in the US. According to official information based on the number of permits issued by the Russian Federal Migration Service, some 100,000 Ukrainian citizens currently work in Russia, although the real number of Ukrainians working there is often estimated to be more in the region of 1million. This out migration is very significant from the economic point of view, since all those working abroad send money back (see chart below) while at the same time are not present in the country to offer themselves for the work which this extra money creates. So out migration and the accompanying remittances are one thing in a high fertility, growing population like that which is to be found in Ecuador or the Philipinnes, and quite another in the long term low fertility, declining population environment of Central and Eastern Europe. Hence all that demand driven wage inflation. 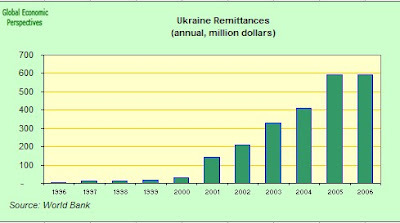 As we can see from the data in the chart below (which the World Bank Economists themselves recognise if surely a substantial underestimation) the flow of remittances into Ukraine has increased steadily in recent years. In many ways Ukraine could be considered to be a rather important strategic unit in the whole Eastern labour supply and demographic puzzle, since many imagine that as labour supply runs out across the whole region, then countries as diverse as the Baltics, Poland, Hungary, the Czech Republic and Russia may all - and at one and the same time - be able to leverage Ukraine's population reserve to help them out of their own difficulties. In this sense many live in the hope that outward flows from Ukraine may serve to plug a lot of otherwise increasingly evident holes in the East European labour force. My feeling is that the people who make this kind of projection for the Ukraine tend to forget three things. 1) The corrosive effect that long term lowest-low fertility across all the East European and many of the CIS societies is already having on the numbers of people who are becoming available in the labour market of these countries. 2) That large migrant outflows from one society to help meet the domestic needs of the labour market in another (Poles and Latvians in the UK and Ireland or Romanians and Bulgarians in Spain) produce significant labour shortages in the home (sending) country, shortages which when combined with rapidly growing domestic demand (and especially for new housing) - domestic demand which is fueled by i) globally available non-local-currency denominated cheap credit and ii) a steady and growing return flow of remittances from those abroad, then this whole process only serves to push up sending country wages very dramatically indeed, and potentially feed through to a loss of competitiveness which can make the whole external position of the country concerned (and with this the local currency, and the sustainability of the non-local currency denominated mortgages) very vulnerable indeed. Let's call this whole process - with no perjorative intention whatsoever - the Baltic syndrome. 3) That these sending countries, and in particular as a result of the processes detailed in (1) and (2), themselves start to experience fairly high rates of economic growth, and as a result they themselves start to need migrants. Ukraine is now a classic case of this process at work. The only thing which remains to be seen here is how all this ends up in practice, since at this moment in time we are all basically off on a voyage into the unknown, since we have definitely never been here before. 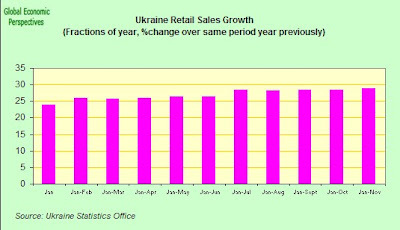 A much fuller analysis of the underlying problem in the Ukraine economy can be found in this post here. 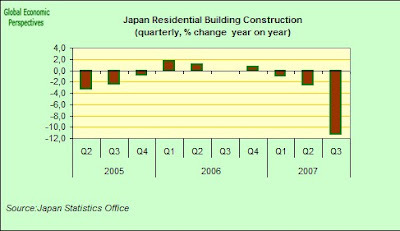 Japan Economy 2007/2008, The Moment Of Truth? 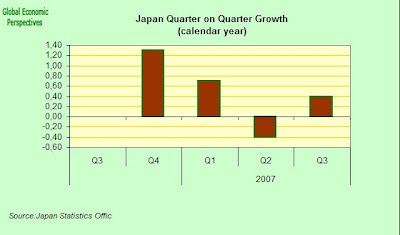 Well the Japan Cabinet Office have just published their monthly economic report together with their their revised forecasts for fiscal year 2008. As could be expected, downward revisions are to be seen everywhere, except in the plans for government spending, which commentators expect may well be up (details of the 2008 budget are due to be released tomorrow), but even this last detail seems pretty ominous in the light of the fiscal problems which Japan faces, and the steadily rising cost of supporting Japan's growing elderly dependent population. What is still the world's second-largest economy is now expected to grow by 1.3 percent in the fiscal year ending March 31, slower than a previous forecast of 2.1 percent. At this point in time it is very difficult to assess the viability or otherwise of this forceast, since it is obviously very sensitive to small changes of environment in key sectors as we move forward. However one or two observations are in order. The first of these is that we are likely to get a very strange reading on Q4 GDP. The reason for this is that GDP growth in Q4 2006 was very high indeed (1.3% quarter on quarter - see chart below - and indeed the strength of this growth threw Claus and I considerably when it happened - and the same was true of what happened in Germany - since we hadn't really forseen the spurt in the global growth rate - who had - and how this would influence the key export dependent economies. Everything is now, however, coming back into line, and I doubt we will see big surprises on the upside across 2008). It is thus very probable that we will see negative year on year growth in Q4 2007 (the high base effect), even if the quarter on quarter Q4 2007 growth rate does not itself plunge into the red (a possibility which is not at all excluded at this point). This strikes me as incredibly optimistic. On the global economy front things are really bound to get worse before they get better. Some economies - Thailand, India, Turkey, Chile, Brazil, India - may well be able to sustain momentum, but Eastern Europe is very likely to suffer a correction (in all probability quite a strong one), while both Russia and China will be struggling with their growing inflation problems. In particular in the Chinese case, some sort of slowdown or other is now almost bound to come - and it can be sharper or softer according to when it starts - since the inflation problem is really about to get out of hand if something is not done soon on this front. The developed economies, on the other hand, will, if they are internal consumption dependent (Spain, the US, Australia, the UK etc) be wrestling for some time to come with the effects of the unwinding of the financial component of the construction boom, while those who are to some degree export dependent (Germany, Austria, Italy, Finland, Sweden - the rapid-ager group) will simply notice any slowdown in the rate of growth in world trade. As for the above-mentioned support from the government and the Bank of Japan, this can only mean more fiscal support and the absence of any further rate increases from the BoJ (Fukui will have to retire without fulfilling his dream, and the big question now is rather when will the BoJ start to talk about coming down again). On the fiscal front slower growth will probably place a squeeze on tax revenue, making it harder for the government to narrow the budget deficit and reduce its 777 trillion yen ($6.9 trillion) debt, which is the world's largest. The 2008 budget outline is due to be released tomorrow, and will probably incorporate an increase in government spending according to a leaked preview which appeared in Nikkei newspaper today. The primary deficit, the excess of spending over revenue excluding bond sales and interest payments, is projected to widen for the first time in five years, according to the article, suggesting that government spending may well rise to something in the order opf 83 trillion yen as the continuous and relentless ageing of the population swellshealth and social welfare costs. Such an increase would constitute a 0.4 percent increase from this year's projected level. Economic and Fiscal Policy Minister Hiroko Ota has already confirmed that the government anticipate that revenue from taxes will start falling, although Finance Minister Fukushiro Nukaga insisted when he spoke to reporters that the government still intends to try to balance the budget by year-ending March 2012. If they go down the road I think they are going to go down, and if this "slowdown" is a drawn out affair - as I think it is very possible that it will be - then it is hard to see this committment being fulfilled. All of this reveals, and very clearly, just how fragile Japan's situation actually is at this point, despite all the bravado, and despite every attempt to put the best face possible on things that you can find in the government reports and the financial press at the moment. Structurally Japan is in a very tight fixt. The central bank has been unable, even during the longest expansion since the late 1980s, to raise interest rates above 0.5%, and the government has only been able to start thinking about reducing the massive outstanding debt precisely when it looks like we may be heading back to recession again, and thus they can't. You don't need to be a genius to see that there is a substantial underlying problem here, and that, in the mid term, none of this is sustainable. Of course, the government fall back on the hope eternal argument of that anticipated rise in domestic consumption, but this failed to materialise during the boom, and I see little reason why we should anticipate its arrival at this point, indeed there are strong ageing-population-related structural reasons for assuming that we won't. Now one of the big debates which is bound to arise is the one which relates to the extent that (yet one more time around) Japan's problems are policy related, and the extent to which they are now "normal" problems associated with the impact of a steadily ageing population which has passed the median age 42/43 milestone. Claus has already drawn attention to Morgan Stanley analyst Takehiro Sato's views in this regard here. Errant government policies have started to hurt domestic demand. First, the availability of consumer financing has dried up and micro businesses as well as small and midsize enterprises (SMEs) are having financing difficulties because Credit Guarantee Corporations (CGCs) started a ‘responsibility-sharing arrangement’ in October. Second, the revised Building Standards Law (BSL) has led to a sharp decline in construction starts. Third, consumption and investment sentiment has been further harmed by the prospect of higher taxes and a return to the 1990s-style fiscal policy. Implementation of the Specified Commercial Transactions Law and the Financial Instruments and Exchange Law (FIEL) can probably be added to the mix too. The FIEL has hampered foreign investors and accelerated yen appreciation. Just to be clear, we do not think that the objectives of these policies are misguided, but hasty moves by bureaucrats to implement such laws, without regard for the economy, have had a considerable impact. We think that such errant policies will result in a policy-induced slump (‘kansei fukyo’). First, the contraction in consumer credit and financing backed by CGCs has already put a tight squeeze on micro businesses and SMEs. With sharp increases in material and energy costs worsening the terms of trade and labor’s share of income still high, SMEs do not have much leeway to increase wages or capex. The tightening of credit may lead to an increase in bankruptcies among SMEs in Jan-Mar 2008, when cash flow tends to be tight. Second, housing investment has fallen off sharply because of the revised BSL and is unlikely to recover in F3/09. The condominium market took a heavy hit, particularly since demand had already been weak amid a decline in what households can afford to purchase. Condo starts have slumped in 2007 and are unlikely to fully recover in 2008 because the bottlenecks that have resulted from government inadequacies are likely to take time to clear up. GDP-based housing investment will probably take longer to recover. We estimate the housing weakness alone shaves 0.3ppt from our F3/08 GDP growth forecast, and do not expect a rebound of the same extent in F3/09. If the situation continues until mid-2008, small and midsize builders are likely to go bankrupt and housing spending would be affected, and hence the problems would be more than just bottlenecks. Third, the government’s discussion of taxes has chilled consumer and investor sentiment. The Cabinet Office’s Council on Economic and Fiscal Policy released an estimate that the consumption tax needs to be increased to double figures, and the government’s Tax Commission is considering raising tax rates and limiting deductibles against income. The need for such a major consumption tax increase is understandable, but we think that the way the idea was floated was not a smart one. More SMEs may go bankrupt, housing investment looks unlikely to recover, and already-cautious consumer sentiment may worsen further as a result of all the talk of tax increases. The prospect of a return to 1990s-style fiscal policy could also harm personal consumption and investment due to Ricardian equivalence. The Specified Commercial Transactions Law and the FIEL, which are nominally designed to protect consumers and investors, actually appear to be dampening consumer spending and investments in financial products. Well the list of policy "errors" is an impressive one, but let's think a little about some of them for a moment. Firstly the Specified Commercial Transactions Law and the FIEL. As Sato says, these are nominally designed to protect consumers and investors, so it is surprising that they are having such a negative effect. Since I am in no position to comment on the details of these measures, I will simply note that the danger of even well intended policy measures going wrong only increases as the fragility and vulnerability of an economy rises, and that is the phenomenon we seen to be observing in Japan right now. For anything to work for you in life you need a certain amount of good luck, and when your luck is down, and the level of adversity you face mounts, then the problems only seem to pile up. This perfectly describes Japan present problem set I think (I mean don't forget the famous pensions-records scandal, which seems to have been all but forgotten at the moment, except by the people who had their records lost, of course). If you really could live without a spanner showing up in the works, then it never fails to show up. That's what we mean by being "down on your luck". As Jefferson said, when I find myself being lucky I am normally sitting here, hard at work at my desk. That is, we make our own luck, using foresight and sound policy. So then there is the housing permits paperwork issue(another of those spanners, I guess). I am sure this has been a factor, but I am sure it is not the whole story. The building permits question was merely the trigger which fired off an already primed gun. Let's look at quarterly annual growth in residential construction. What we can see here is that the drop in Q3 is large and significant, but that the downward trend was already present even before the permits problem hit, and the situation is probably now being fed more by the knock-on effects of the credit crunch and the sub-prime concerns than by the paperwork issue itself. As such we should not anticipate any early resolution of the problem, although the rate of downturn is obviously going to ease up. Lastly we have the fiscal issue. Now as Sato again notes, the reasons why people have been talking about such a consumption tax increase are understandable, since government debt problems are important, but as we can see from what has happened in Germany with the 3% VAT hike in January, in a society with a high median age population where domestic consumption is fragile, loading up the consumption tax is definitely not a good idea. Other solutions need to be found, and many of these will now involve cuts in provision I fear. This is the price to be paid for having left the ageing issue unattended for so long. There is now a certain inevitability about things. Which is why it is also worrying that Sato says this: "the prospect of a return to 1990s-style fiscal policy could also harm personal consumption and investment due to Ricardian equivalence." Leaving aside the knotty problem of whether or not there is such a thing as Ricardian equivalence, I take this to mean that he anticipates a return to fiscal deficit stimulus support. This is a very dangerous road to go down for an economy in Japan's situation. Each recesssion now is not simply a repeat of the earlier one, since each time now the screw will turn another notch, and one day something or other will break. Japan needs to look for long term solutions to its problems, which mean facilitating substantial immigration in the short term, and a radical change in fertility policy to try to address the longer term issues. Will we see that happen? I am not optimistic, but then the longer you keep saying that fertility doesn't matter, the longer people continue to think that there is no important and pressing reason why they should have children. That is, the situation becomes self-perpetuating. This is the damage that is doen by denial. Well, as forecast yesterday by Nikkei, the Japanese Ministry of Finance has today announced that Japanese spending will rise by 0.2 percent to 83.1 trillion yen ($735 billion) in the year starting April 1 2008. The government will sell 25.3 trillion of new debt, almost the same as this year, to help fund the deficit. This spending increase may not seem that significant, but it will mark the first time Japan's budget deficit has increased in five years and will inevitably call into question Prime Minister Yasuo Fukuda's resolve to cut the world's largest public debt, following the recent electoral trouncing of the LDP. According to the Japan MoF's own figures debt of central and local governments combined will now reach 776 trillion yen by March 2009, equal to 147.2 percent of gross domestic product. That compares with 149.6 percent as of March 2008. The significance of the present decision is that this trend may now reverse, and this of course raises the issue of just when the trend can revert back to debt reduction, given the presssure of population ageing, the rising median age of voters, and the fact that Japan is actually ageing more rapidly than anticipated in earlier forecasts. Ageing population related welfare costs and interest payments on bonds now account for approximately half of total spending in the budget. General expenditure, covering items ranging from defence and public works to social welfare and education, is projected to rise 0.7 per cent from the current fiscal year to 47.28 trillion yen, largely due to an increase in social security payments. Social welfare, which accounts for 46 per cent of general expenditure, will rise 3.0 per cent as Japan’s ageing population requires more spending on pensions and medical services. The new budget sets aside 7.44 trillion yen for pension payments, up 5.8 per cent from the current fiscal year. The government is also planning to increase tax grants to municipal governments by 4.6 per cent to 15.61 trillion yen to respond to pressure from rural voters to increase spending in an attempt to reinvigorate regional economies. Interestingly enough the MOF has managed to reduce new debt issuance by 0.3 per cent to the above mentioned 25.34 trillion yen, in large part by increasing non-tax revenues such as transfer of surplus funds in the foreign exchange special account to the general budget account. Oh, that trade surplus! What all this means is that the so-called primary deficit - the excess of spending over revenue excluding bond sales and interest payments - is now set to grow to 5.2 trillion yen from this year's 4.4 trillion yen. And remember, despite the fact that the government yesterday redced its growth forecast for the current fiscal year, it is still anticipating 1.3 percent annual growth in this fiscal, and 2 percent next year. Any slippage on this will mean an even greater tax shortfall and hence a higher budget deficit.